Great art addition to Ice Cream shops, Barber Shops, Hair Salons, Vintage lovers, Dressing, bedrooms, Burlesque and pinup Man Caves too! A signed and numbered print from an original painting by Daniel Vancas. Originally painted on the historic Elvgren 1930s easel. I classic pinup for today and timeless..
Also available on large canvas giclee, just ask. 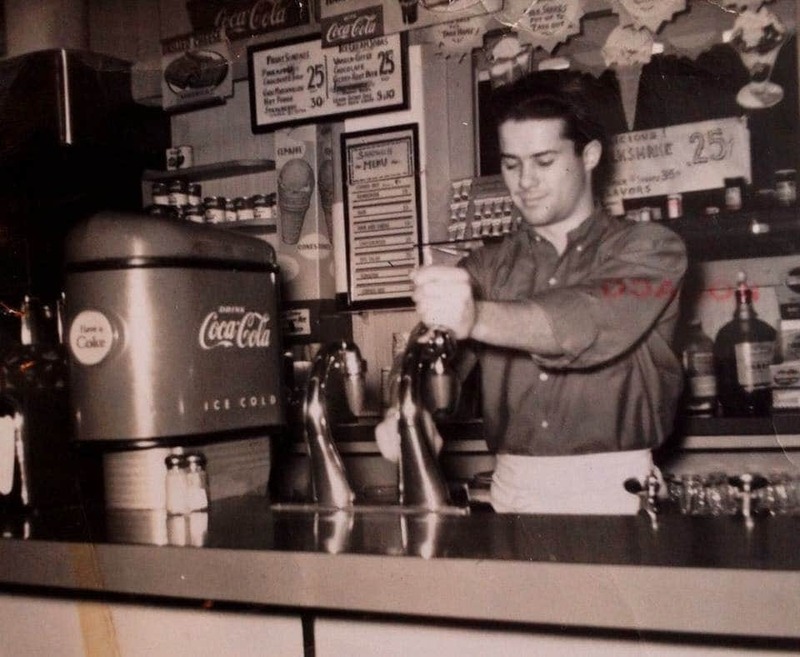 THE SODA JERK and 1950s MILKSHAKES! 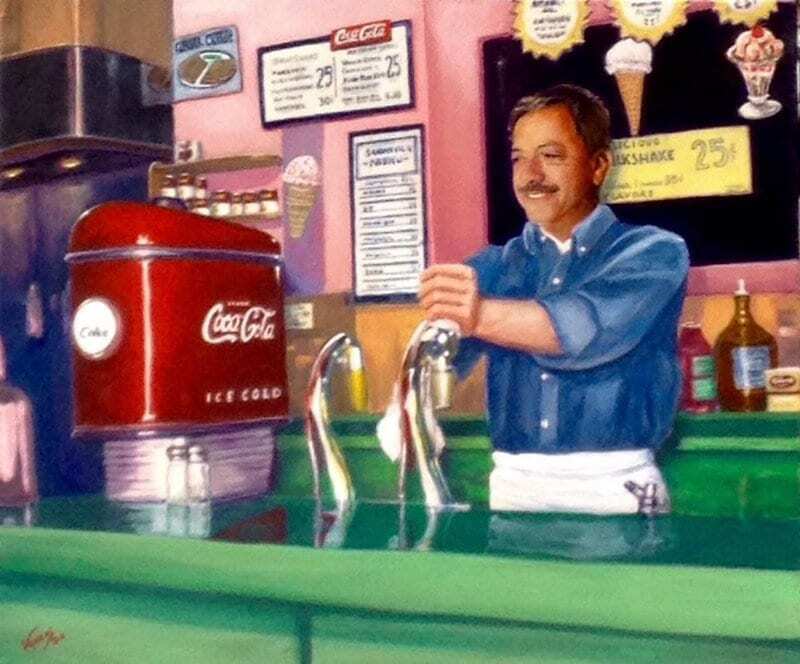 This is a painting by me, Danny Vancas of a SODA JERK working a small lunch counter. It was created from 1958 old family album photo. I miss these lost vestiges of a bygone era. The best soda jerks were, to us little kids, a sweets serving a version of a life counseling bartender. I want a root beer or coke float, please! I painted it with a variation placing what would look like the owner of the shop as the "Soda Jerk". The original painting has sold. But I can paint a variation of it if you like. The "Soda Jerk" was a bartender of sorts serving up delightful sweet concoctions to stressed Mothers out Shopping with restless children with too many questions... Myself being one curious boy. I saw cute ponytailed teens flirting with pimply pubescent boys trying to be grown up tough in leather jackets, ducktail pompadour, smelling of too much V-7 or their father's Old Spice! The ice cream treats never tasted so good as then... So Enjoy, sip a root beer float and dream of a better time!! You can order this signed Giclee art prints if you like or... Commission me for a custom painting. 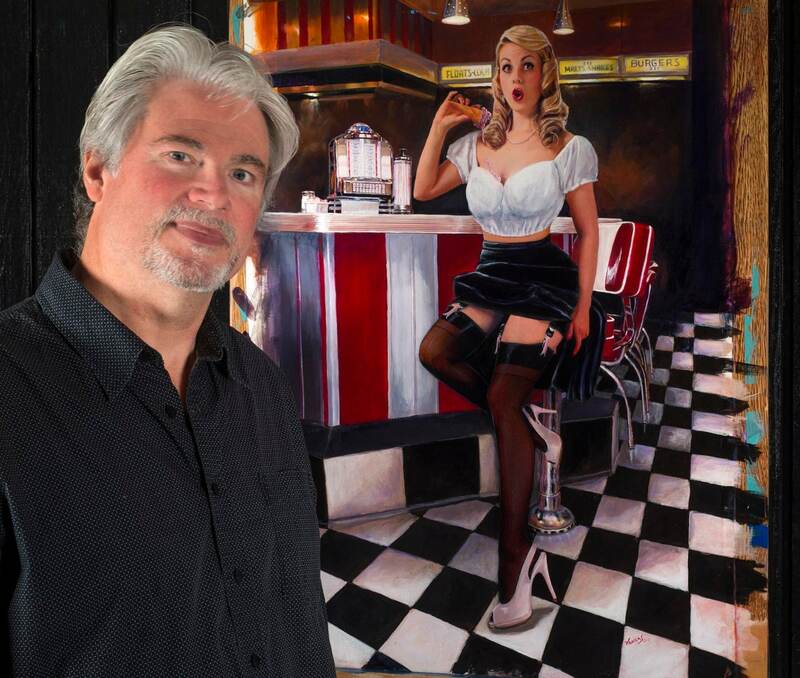 DANIEL VANCAS IS ALSO THE AUTHORIZED ELVGREN PIN-UP COCA-COLA REPLICA ARTIST! (c) 2015-16 BY DANIEL VANCAS All Rights Reserved. A Great gift for those into Diner, burger joints, Ice Cream, Coca-Cola, Coke, Hot Rods, retro wear, vintage clothing, W.W.II and Korean Warbird, nose art and aviation collectors; and of course those that love their Martini, swing, RAT PACK, Sinatra, Elvis, Marilyn and Rock A Billy set. Would look great by the dresser, pool table, bedroom, bathroom, game room, and with 1930's art deco furniture, original paintings, and sculpture. As a proud owner of the Elvgren trademarks, Daniel Vancas has used these marks continual since 1994, 1st issue 1997 and re-issued, final, over 10-year use, Nov.15, 2005. Daniel Vancas is listed as a Vero I.P. Property Rights Owner with E since 2001. His Elvgren TM has been approved and accepted as the separate ownership of Daniel Vancas, as agreed with B&B in permanent and final agreements which were made an order and recorded in Federal Court March 2001. 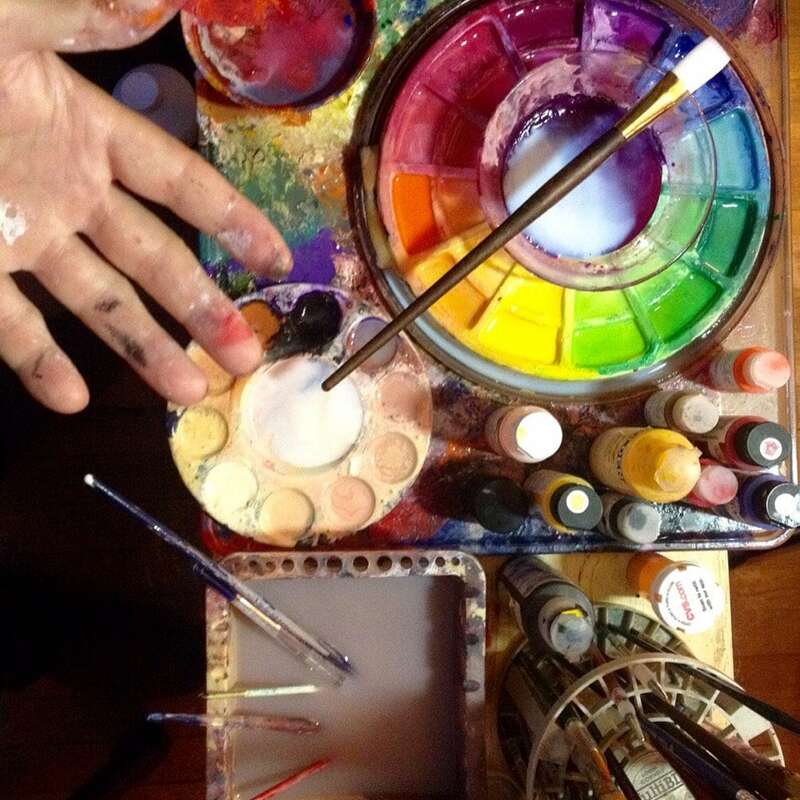 Per this order licensee's or their 3rd parties of B&B, such as art dealers, authors, book publishers may NOT disrupt, slander Mr. Vancas art business and/or I.P. (Which includes this auction, slander on his name and products, his lawful trademarks and derivative artist copyrights on apx 130 Elvgren images, paintings, prints etc.) This being said this mark was reconfirmed and re-issued by the Federal Trademark and Patent Office, after they LOST (due to unknown internal loss or theft) Daniel Vancas' 5-year filing and use statement along with a major portion of his original TM files. There was no cancelation of registration for any other reason. Because of his documented confirmations, use and supporting court order, the TM registration was promptly re-issued to Daniel Vancas. 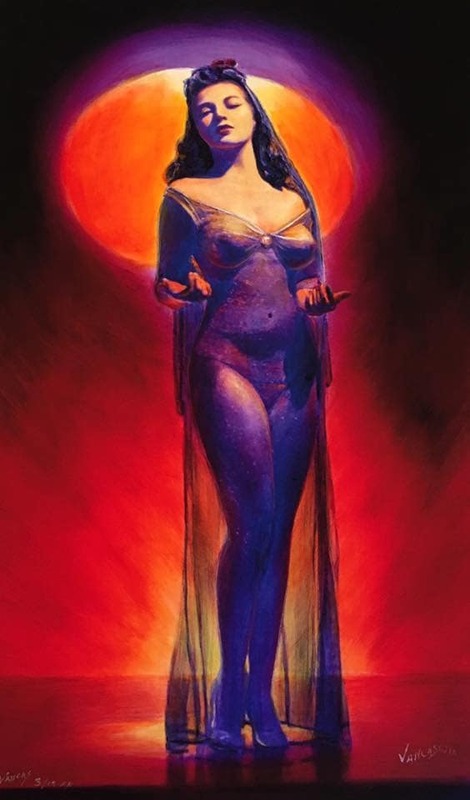 Because of reported and documented long-term email and other harassment by mean-spirited art dealers and their "friends", Please advise us if anyone contacts you to discourage you in any way, even your interest to buy this beautiful print or original painting lawfully produced by Daniel Vancas, all supported by his Elvgren Intellectual Property, his Trademarks, and his permanent binding agreements. Which include Court Orders and Court Determinations in 2001, 2002 & 2003 confirming Daniel Vancas' authority, rights, ownership, the right of ownership and trademark standings and use for over 10 years.